Reviewing it through the medievalist perspective, the first thing I noticed was that this was not set in the Middle Ages, but more a blend of ‘sometime in the past’ with a little steampunk. The filmmakers even deliberately state they won’t be giving us a supposed date to these events, or even that it is history. What we do get is arrows that shoot like bullets – the machine gun crossbow is a nice touch – and a city of Nottingham which has flames spewing out of every second building – because of the mines, I guess. Some viewers will view it as ridiculous, but I rather liked this take on the story – giving us something of a new setting to play with. The story moves quickly as Robin and Marian meet at the beginning, and falling very much in love. All is happy until Robin gets a letter – he’s been drafted to fight in the war! We next see him in ‘Arabia’ fighting in the crusades, where you get scenes seemingly lifted from World War Two films. It’s not too long before we return back to England and Nottingham, where the city is now under the crushing grip of its Sheriff. As all Robin Hood stories go, the tale involves one where the rich and powerful are taking from the poor and weak, and our hero being the one who will make things right. The main baddie in this case is the Sheriff of Nottingham, played by Ben Mendelsohn, who seems to be reviving his Orson Krennic character from Rogue One: A Star Wars Story. The Church also is presented as the major villains as well, but there is a lot of corruption to go around. Taron Egerton gets the starring role of Robin of Loxley, but this action hero doesn’t have the charm that he gives off in the Kingsman films. Jamie Foxx is our ‘John’ who gets to be Robin’s trainer and mentor, and we also get our Friar Tucks and Will Scarletts as well. Marian, played by Eve Hewson, is given a lot of screen time here, and delivers the best performance of the cast. 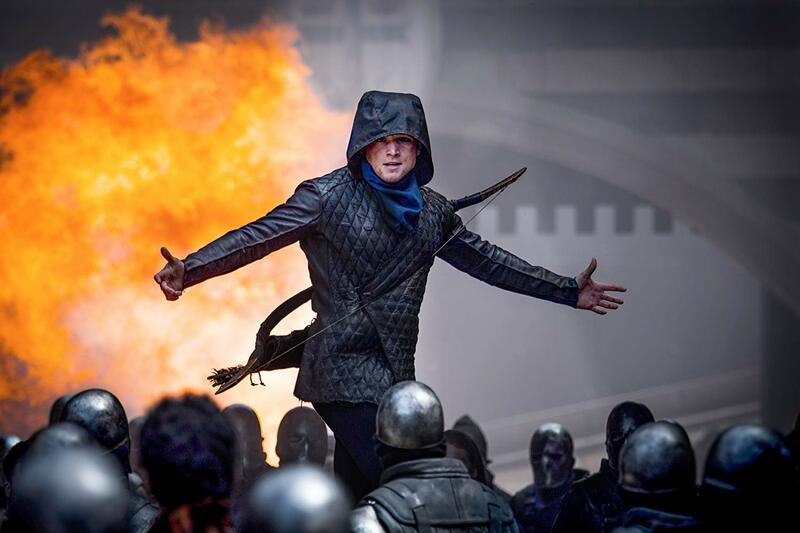 This is very much an action film, with lots of arrows being shot, and our Robin doing his best to fight and escape from the legions of armoured henchmen. The fight and chase scenes predictable, but passable. It offers up a lot of noise, but nothing memorable. I think most moviegoers will say this is an okay film, while more seasoned reviewers can pick out lots of problems with weak dialogue and an overly serious plot. As for insights gleaned by the medievalist reviewer, it is best to say that the movie loosely borrows some medieval elements, but it certainly does not come across as something set in the Middle Ages. At least I hope the filmmakers did not think this was what they thought the medieval period might have looked like!